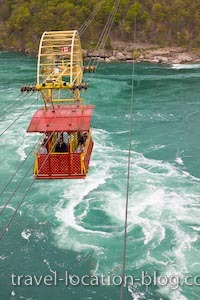 Picture of the Spanish Aero Car, built in 1913 and opened in August 1916, this cable car is suspended above the Whirlpool Rapids of the Niagara River. The fact that it's considered an antique cable car shouldn't put you off! Modified several times since its installation in 1916 and with room for 35 standing passengers, the Spanish Aero Car provides a mesmerising view of the Whirlpool Rapids. The whirlpool is created by the sudden change of direction of the Niagara River which takes a sharp turn to the right and almost turns back on itself. This picture shows the Spanish Aero Car passing above the Whirlpool Rapids of the Niagara River down stream from the famous Niagara Falls, Niagara River Parkway, Ontario, Canada.